Recommended by Hal “BikerDoc” Mette. SkyMED is one of the only companies that covers you at home, away from home, and worldwide. The at home part is significant, because the majority of medical emergencies occur within five miles of your home. 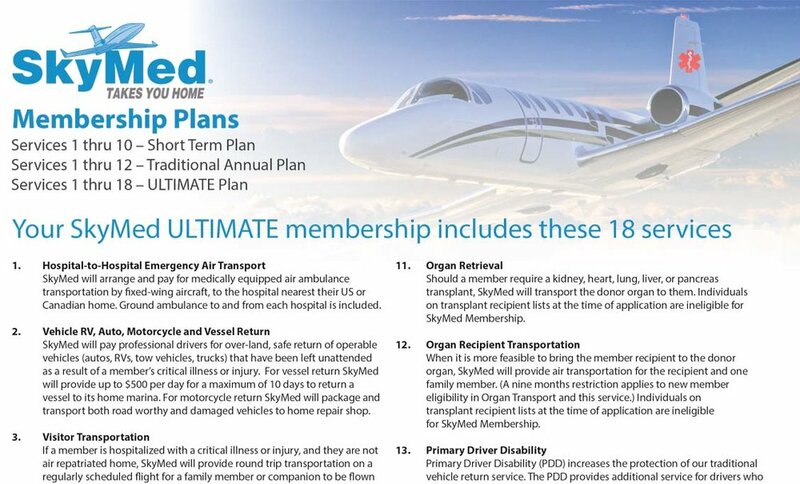 When traveling SkyMed will get you home, your significant other home, your children and grandchildren home (under age 18), your Spyder Motorcycle home, your car home, or even your RV home. The Spyder Aftermarket Source Group designed for Manufacturers to discuss their products for the Spyder Riders around the world. Riders can join and have first viewing of new Products Aftermarket suppliers want to introduce while being able to talk and discuss the products posted. Click the image to join the Group on Facebook. We encourage all Spyder Riders to join to stay One step ahead on all the new innovative products to come to provide a stylish upgrade or better ride. First let me say thank you to Central Florida PowerSports for allowing me an extended test ryde of the new 2018 F3 Limited with BRP Connect. The handling and performance characteristics of the 2018 are virtually identical to the 2016 and 2017 F3T and F3 Limited so no need to focus much on that if you test ryde for an upgrade. Of course the much mentioned cluster is the big upgrade on the bike. The visibility on the all digital gauge is indeed greatly improved. If you are an old folk like me you will need bifocals to read the small print in the trip stats and a couple other areas, but the real excitement was when I took my non-visually impaired next door neighbor for a ryde and he could read even the fine print on a sunny Florida day while sitting in the back seat. No more screen sunshine washout. One comfort factor that I had not expected came from the elevated back seat. That increase in the back seat height also increases the amount of seat support for the back of the driver. For the first time since 2010 I could ride the Spyder over 100 miles at a time without a driver backrest and experience no pain. Granted I currently ryde a 2016 F3T so the 2017 model may have already provided this feature. The joystick (the replacement for those little directional buttons) is easy to handle in terms of maneuvering through the screens and I particularly liked the trip stats report that I left up on the right of the screen most of the time. Of course, the joystick takes you through all the the setting features previously available on the Spyder. 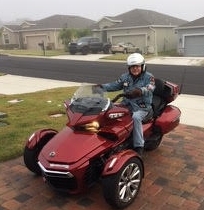 The features of pairing the Spyder with the smart phone and the driver comm system went smooth as silk although in two days I was not able to pair the passenger comm (Sena 20S) with the bike. The music from FM and my iPhone was amazing on the six speaker sound system on the limited. Also I was surprised to get better FM reception out in the countryside than I had ever experienced before. When you access BRP Connect life gets a little more complicated. First of all you need to download the BRP Connect apps to your phone before you arrive for a test ryde and you need to configure your phone so that all privacy and security blocks are removed to allow BRP Connect unbridled access to your phone information, otherwise you will be asked to authorize it on the phone every time you start the bike. By the way, when you start the bike there is a little download time from the smartphone to the bike that is required before you can really get started. For the experienced ryder, I recommend you study everything available about the cluster and BRP Connect before the ryde. I got stuck in a loop, i.e. frozen within BRP Connect, a few times and I wondered if it was my technical ineptness but I had it rechecked by the GM, Master Spyder Tech, and top sales person and they verified my findings. There seems to be some minor issues with BRP Connect to be resolved - not uncommon with new software. I studied every video I could find on the new bike and on BRP Connect. I find there is a need for a more detailed tutorial for BRP Connect that focuses especially on the mechanics of its use, not its concept. If a newbie friend decides to take a Spyder for a test ryde, I suggest you counsel them to take two separate and distinct test rydes. One without BRP Connect focusing on the Spyder's handling and performance characteristics that differ so much from other rydes and then after considerable study and preparation, take a second test ryde using the full screen with BRP Connect capabilities. This ryde could be mind blowing for a newbie if you try to digest everything at once. Your comments and personal experiences with the new 2018 Instrument Cluster and BRP Connect are welcomed.